Group Show Press Release Jason Haam is pleased to present a group exhibition featuring a selection of works by: Ahmed Alsoudani, Oliver Arms, Peter Buggenhout, Marie Cloquet, Jung Jae Ho, Linn Meyers, Jin Meyerson, Anthony Pearson, Florian Schmidt, Mircea Suciu. Opening exactly a year after the gallery’s inaugural exhibition with Oliver Arms, the exhibition will be on view from January 25th, 2019 through March 12th, 2019. Since its inaugural exhibition, Jason Haam has maintained a strong program, devoted to its artists and has attempted to fulfill its role as an international platform by presenting contemporary artworks to its audience. This group exhibition showcases a selection of works representing the practice of each artist. As a witness to the violence of the first Gulf War, Baghdad-born artist Ahmed Alsoudani addresses the physical consequences of war and psychological remnants of violence within his works. 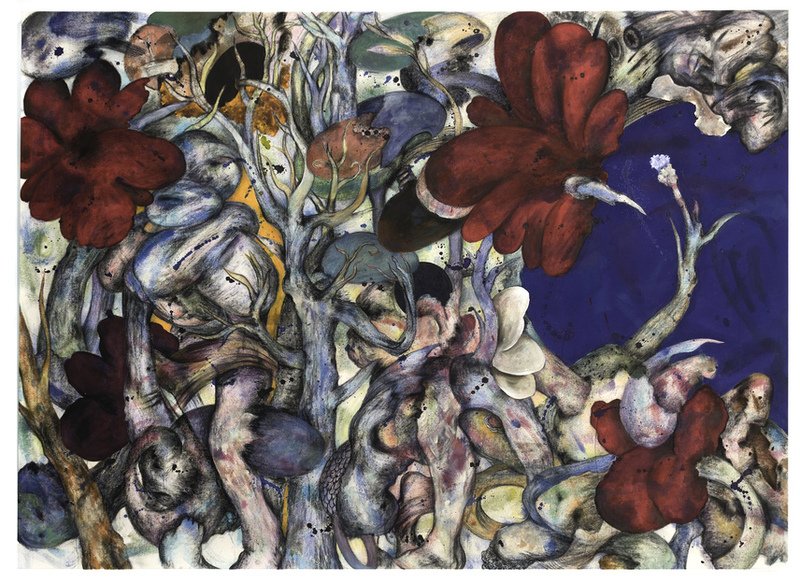 In Flower (2018), suggestive figures of severed arteries, dismembered limbs, and tumorous organs are disguised beneath silhouettes of floral imagery. Layering multiple narratives and abstracting fragmented forms within a single image, Alsoudani develops a pictorial language characterized by personal experience that embodies the universality of human suffering. Romanian artist Mircea Suciu explores the psychological effects of socio-political events through combining different materials with the monoprint technique. Study for the Iron Curtain (2014) portrays a figurative and literal representation of the Iron Curtain, covering a sheet of cloth over the object. Revealing absence and concealing presence, Suciu uses physical and psychological tension to create an unsettling sense of fear. Through his portrayal of the urban landscape, Jung Jae Ho presents traces of modernization and cultural development found within the physical environment and collective conscious. In Friend (2018), Jung portrays a scene in which he witnesses during his morning commute—an object of death. Using charcoal and acrylic paint on Hanji, a type of Korean paper, Jung creates a delicate, evocative landscape that seems to depict a scene of accumulated narratives and time. Creating highly condensed compositions of distorted and manipulated images, Jin Meyerson portrays the transmission of information in the digital age. From a series of the artists’ personal iPhone images, Untitled (Paradise) (2018), depicts a figure wrapped in bedsheets. The oversaturation of color creates an illusion of movement—the way an image flickers across a digital screen. Manipulating photographs of landscapes by manually deconstructing and reconstructing images, Belgian artist Marie Cloquet reveals the ‘in-between’ spaces of place and time. In Obstacles XI (2018), a shadow of cloth is veiled over the constructed landscape—a manifestation of process within composition. In this way, Cloquet portrays a visual image of physical process and creates a physical form of abstract space. As sequences of dots and lines appear within close proximity, Linn Meyers creates visual forms of movement on a two-dimensional plane. In Untitled (2018), the square within the center of the composition functions as a principle order to which each mark responds—the creation of structure and form within the work. The progression of the image evolves from an organic process as a reconciliation between intent and intuition while revealing traces of movement from the body through space. Through the repetitive act of building up and wearing down paint, L.A.-based artist Oliver Arms creates abstract works that unveil content through form. Native Son (2014-2015) takes its title from the novel by American author Richard Wright of the same name. The antithetical nature of Arms’ process demonstrates a visual exchange between structure and form—between marbled layers of paint and expressive brushstrokes—evoking the emotions and experiences of one man’s unavailing attempt to respond to the inevitable systematic construct of society. Austrian artist Florian Schmidt explores the physical act of painting through the relationship between materiality and visual images. In Untitled (Deviation) 16 (2018), pictorial composition is constructed of geometric shapes made from cardboard panels; these panels are repurposed material—remnants from previous works. By using elements of deconstructed form, process manifests as a physical form within the work and is re-contextualized as structure within composition, as materiality creates illusions of depth and pictorial image onto the surface of the work. Manipulating material through organic processes, Anthony Pearson’s body of work incorporates elements of painting and sculpture. Pearson’s Etched Plaster series emphasize the physicality of material and the fluidity of form. After pouring hydrocal, a type of gypsum cement, into hand-made frames, the artist creates a system of mark-makings, revealing detailed reliefs on the surface. These reliefs cast shadows as light is reflected onto the surface, continuously transforming the work as an image. Peter Buggenhout uses abject materials such as blood, hair, and cow stomach to create works without symbolism. His sculptures are not representations of objects, but rather analogies for the functions of our world. In Weke delen #2 (2000)—the literal translation being “soft tissue” in Dutch—Buggenhout decontextualizes material to recreate form. Although its suggestive title allows a sense of visual familiarity, its material composition negates any sense of contextual reference. 그룹전 제이슨함은 개업 1주년을 맞이하여 10인의 작가들로 구성된 그룹전을 개최한다. 제이슨함은 개업 이래로 세계적으로 각광받는 현대미술 작가들의 전시를 관객들에게 선보이기 위해 노력해왔다. 이번 그룹전에는 제이슨함에서 개인전 또는 그룹전에 참여한 바 있는 작가들을 비롯하여 해외 유수 갤러리와 미술관에서 전시 활동을 이어나가고 있는 작가들의 작품을 한 자리에 모은다. Ahmed Alsoudani, Oliver Arms, Peter Buggenhout, Marie Cloquet, Linn Meyers, Jin Meyerson, Anthony Pearson, Florian Schmidt, Mircea Suciu, 정재호의 작품을 소개하며 전시 기간은 Oliver Arms와의 첫 전시회 시작일로부터 정확히 1년이 지난 시점인 2019년 1월 25일부터 2019년 3월 12일까지이다. Ahmed Alsoudani는 걸프전의 참혹한 폭력의 목격자로서 작품 속에 전쟁이 남긴 심리적 압박과 폭행의 참담한 잔해에 대해 이야기한다. Alsoudani는 한 화면 안에 여러 개의 서사와 흩어진 형상들을 추상적으로 풀어냄으로써 공동체 의식으로 연결되는 개인적 경험을 드러내보인다. 이번 전시에서 선보이는 <Flower>에는 꽃의 실루엣 아래에 절단된 신체, 동맥, 장기 등의 형상이 숨겨져 있다. 이처럼 작가는 정해진 문맥이나 형식에서 벗어나 오로지 시각적인 표현을 통해 새로운 표상을 보여준다. 루마니아의 작가 Mircea Suciu 역시 작가 개인의 경험에 연유하여 작품을 제작한다. Suciu는 모노프린트 기법을 기반으로 여러 안료들을 혼합하여 사회적, 정치적인 주제를 이야기한다. <Study for the Iron Curtain>은 제2차 세계대전 이후 유럽을 갈라놓았던 철의 장막을 은유적으로, 또 한편으로는 직접적으로 재현해내고 있다. 어떠한 대상을 천으로 덮어버림으로써, 물질적인 부재를 드러냄과 동시에 반대로 심리적인 존재감을 은폐시키며 보는 이로 하여금 불안함을 조성한다. 정재호는 1960년대 전후 국가 주도로 진행된 근대화 과정의 상징인 도시 풍경에 주목하여 화지에 옮김으로써 근대 도시에 대한 관심을 유발한다. 이러한 방식으로 기록된 이미지들을 통해 전체를 강조한 국가주의 문화가 개개인에게 남긴 흔적을 좇는다. 정재호는 한지 위에 아크릴 물감과 목탄을 사용해 섬세하지만 그 안에서 축적된 시간과 이야기가 살아 숨 쉬는 풍경을 그려낸다. 이번 그룹전에서는 출근길에 마주한 죽음의 장면을 담은 작품 <친구>를 선보인다. Jin Meyerson은 원본 이미지를 부분적으로 왜곡하고 조작하여 고도로 응축된 풍경을 창조한다. 현실과 가상 이미지의 혼합이 기묘한 조화를 이루어 마치 디지털 시대의 이미지가 전송되는 순간을 포착한 듯하다. 작가의 아이폰 속 몇 장의 이미지로부터 완성된 <Untitled (Paradise)>은 이불에 싸여 있는 한 인물을 그리고 있다. 높은 채도의 색감은 이불이 움직이는 것처럼 일렁이는 효과를 자아내며 이는 마치 디지털 화면이 깜박이는 듯한 환영을 불러일으킨다. 벨기에 출신 작가 Marie Cloquet는 촬영한 사진을 해체하고 재구축함으로써 이미지를 새로운 시간과 공간의 맥락에 두는 작업을 전개한다. 사진은 왜곡되어 인쇄되고, 이후 찢겨져 콜라주 방식으로 재배열 되는 과정을 거친다. Cloquet는 새로이 구축된 풍경 위에 수채물감으로 채색을 더해 은은하고 서정적인 분위기를 확장한다. <Obstacles XI>에서는 천의 이미지가 추가되어 너머의 풍경을 보는 것을 막는 물리적인 방해물이 된다. 이로써 현실과 가상 사이 어딘가에 놓인 새로운 공간을 표현하여 동시에 작가가 주목하고자 했던 세상 주변부의 장소를 환기한다. Linn Meyers는 반복적으로 치밀하게 점과 선으로 화면을 채워나가며 2차원의 평면에 유연한 움직임의 흐름을 만들어낸다. 특별한 기술적 도구 없이 작가의 손끝에서 완성되는 작품들은 시간 경과에 따라 구조와 형태가 드러나면서 생동감이 분출하는 이미지를 구성한다. 그룹전에서 선보이는 <Untitled>는 중심을 휘감고 도는 듯한 형상이 특징적이며 압축과 절제가 조화를 이루어 명상적 분위기를 자아낸다. Oliver Arms는 캔버스에 유화 물감을 바르고 말리는 과정을 반복하여 층층이 쌓아 올린 뒤, 산업용 벨트 샌더로 표면을 갈아내며 양감을 무너뜨리는 동시에 색채를 드러낸다. 오랜 시간 작가의 손을 거쳐 드러나는 Arms의 작품 속 강렬하고 매혹적인 색과 질감은 그 자체로 시간에 대한 기록인 셈이다. <Native Son>은 미국 작가 리차드 라이트(Richard Wright)의 동명의 소설 제목에서 따왔다. Florian Schmidt는 시각적인 이미지를 통해 회화의 물리적인 존재를 탐구한다. <Untitled (Deviation) 16>을 비롯한 작가의 작품들은 기하학적인 형상을 하고 있으며 락커, 실리콘, 비닐, 골판지 등 이전의 작품에서 사용되었던 재료를 재사용하여 덮여있다. 이 혼합체 위에 페인트칠을 더하니 바탕재의 색감이 비추어 드러나 표면에 미묘한 차이를 부여한다. 해체된 상태의 재료들은 재활용의 과정을 통해 평면 구성 안에 자리하는 물리적 형상으로 다시 해석된다. Anthony Pearson은 조각과 회화의 요소를 모두 가지고 있는 작업물을 완성시키며 두 갈래의 예술 영역을 넓힌다. <Untitled (Etched Plaster)>는 액자틀에 석고의 한 종류인 액체 하이드로칼(hydrocal)을 붓고, 이후 굳어진 표면을 조각하여 자연현상을 연상시키는 이미지를 형성한 것이다. 이 석고 부조 작업은 빛과 주변 환경에 따라 양각이 두드러지는 표면의 그림자가 변화하여 새로운 경험을 제공한다. Peter Buggenhout는 피, 머리카락, 소의 위장과 같은 재료들을 사용하여 어떠한 상징주의나 특정 대상을 재현하지 않은 조각물을 만든다. 재료를 해체하고 재구축함으로써 본래 재료가 갖던 일상의 사물이라는 맥락을 벗어나 작가가 빚어내는 조각의 일부로 편입시킨다. Buggenhout의 작품들은 무엇과도 닮지 않은, 어디에서 본 것 같지도 않은, 낯선 개체로서 존재한다. 이번 그룹전에서 공개하는 <Weke delen #2>은 무언가의 재현이라고 하기에는 추상적이고, 추상이라고 하기에는 실체적이다. 제이슨함은 국적이 다양한 작가들이 각자 세상을 바라보는 관점 그리고 고유적 특성을 드러내는 다양한 표현 기법들을 관찰할 수 있는 전시를 선보인다.